If you want to know the state of the UK's record shops, you could read one of the numerous 'vinyl revival' pieces that'll likely appear in the run up to April's Record Store Day. Over 4.1 million records were sold last year, these will tell you – up from a paltry 205,000 a decade ago – and that figure's growing over 20% a year. The number of independent record shops is also soaring, from a low of 299 in 2009, it's now at some 400, about the same level as a decade ago. Vinyl's gold is the message, which partly explains why record labels are able to chuck out seemingly anything for Record Store Day, and someone will buy it. This year's 503-strong release list includes, for instance, a recording of the sounds of sculptor Anthony Gormley's studio, as well as Shaggy's 'O Carolina' on green vinyl. But you get a slightly different impression if you talk to the people who actually run shops. "Our store struggles," says Spencer Hickman of Margate's Transmission Records. Hickman used to be head of Record Store Day in the UK, until he both decided it had lost its way and ran out of time (he's also head of music for collectibles company Mondo and runs the Death Waltz label). "I regularly pay bills out of my own account," he adds. He's opening a bourbon bar inside the shop next month to help. "We're treading water, but it feels like we're having to put in more and more every day," says Rupert Morrison of Drift in Totnes, Devon. That doesn't sound like a worrying statement, but it is when you realise Drift's seen as a success and Morrison admits the "vinyl boom" means his shop's turnover has been growing "a good 10-15%" for the past five years. If a celebrated shop's only treading water, what's the hope for everyone else? 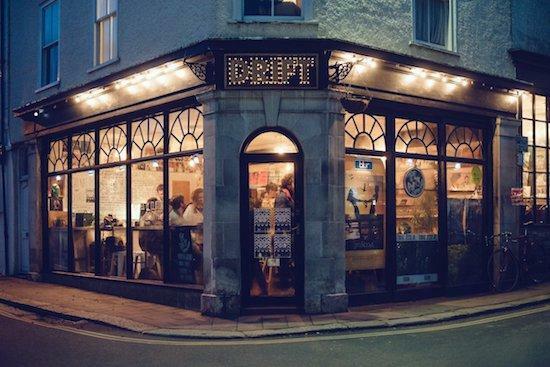 Drift's been selling coffee for nearly three years to improve its takings and atmosphere, and has just got an alcohol licence to take that further. So what's the problem? Arguably, it's the record boom itself. Just as record shops have been staggering back to their feet, recovering from streaming's rise, vinyl's popularity has led to a huge increase in competition, as well as the emergence of new business models, that has made running a record shop for some just as much a slog as before. "You could spiral off a list [of problems]," says Morrison. "There's labels selling direct to fans, bands selling direct to fans, supermarkets wading in, needless pressings, all these new shops popping up getting hold of limited releases." Some things on Morrison's list are easy to ignore. Yes, bands and labels sell vinyl direct to fans far more than they used to, but it'd be a strange argument to say they should instead be giving them to record shops. Sainsbury's selling vinyl also isn't an issue, even if the supermarket is apparently selling a quarter of all records now, has set up its own label and is somehow getting hold of limited edition silver David Bowie reissues meant for "bricks and mortar" stores (a cheeky phrasing by the record company to pretend the reissue's cool, and not going to supermarkets). "If you're buying a record from Sainbury's, you're only going to buy a record from Sainsbury's," says Hickman. "It's not going to take money from the indies." You also can't really have a go at the numerous new stores opening, such as those many cafes with a handful of records for sale in a side room. They might not be 'proper' record shops, but they've often been set up by people just as passionate about music as anyone else (I spoke to Stylus Lounge in the small Hertfordshire market town of Baldock for this piece – a store whose Facebook page makes it look as much a quaint gift shop and cafe as record store – and the owner, Jason, reminisced so long about his teenage years hanging out in Our Price, it was easy to see his shop was entirely a passion project). But Morrison's certainly right that album special editions, where bands put out their record on, say, a coloured vinyl or with a few bonus tracks, are a big issue. Why? Because fans then only want those editions, and if a record store doesn't have any, it's screwed. Morrison gives an example of this year's much-hyped Insecure Men record. Fat Possum put out its own edition of the album on clear vinyl with a bonus 7", so collectors clearly went to them first. But it also put out a limited edition cherry cola-coloured version for indie shops. Drift sold a bunch of those, but the record's distributor actually asked Drift to slash its order as other shops needed them. Since then, Fat Possum has announced a special yellow pressing, again only for indie stores, which should be available in April. But because that's in the works, few people are buying the everyday black vinyl, which is just sitting there on shelves, unwanted, unloved. Joe Blanchard of Sheffield's Bear Tree Records (which pressed coloured editions of King Gizzard & the Lizard Wizard's Polygondwanaland for several indie shops) and Joey Bell of Nottingham's Forever Records both agreed this was an issue, but said it was a hard job for the distributors. "If a record's limited to 1,000 copies, and there's 300 stores, how on earth do you divide that?" Bell asked. There's a feeling the "Premier League" of record shops – the oldest – most likely get what they ask for. "But they spend the most money, so why shouldn't they?" Bell added. Some special editions your local stores can't get hold of no matter how hard they try. Over the past five years, there's been a rise of vinyl clubs that are pressing up exclusive editions that only their subscribers can buy. Top of the list is Denver's Vinyl Me Please. It has an annoying slogan – "The best damn record club" – and an even more annoying habit of sending out cocktail suggestions with its monthly records, but there's no denying its business model's a good one. It negotiates exclusives with labels pointing out it'll put that album into the hands of every one of its 30,000 subscribers (1,800 of whom are in the UK). It has done some fantastic releases, like Notorious B.I.G's Ready to Die and Betty Davis' Betty Davis. March's release was a tenth anniversary reissue of Beach House's breakthrough Devotion, on "gold cloud burst" vinyl with a lyric poster handwritten by frontwoman Victoria Legrand. It's a beautiful package. The side effect is its existence means UK record shops are expecting to sell bugger all copies of Devotion themselves this year. (VMP profiles bricks and mortar record shops on its website, which comes across somewhat awkwardly given its business model). Rough Trade – the indie chain, which now has shops in Nottingham and Bristol, as well as London and New York – regularly uses its might to negotiate similar exclusives for itself. It's right now got an exclusive edition of Nils Frahm's All Melody, for instance, which comes with a third LP of bonus tracks. There's 2,000 of them, so it's unlikely they're going to run out anytime soon and if you're a Nils Frahm fan, why on earth would you go to your local store and buy the bog-standard edition when that's only a few quid more? Rough Trade, of course, gets copies of indie store editions, despite its own exclusives. Rough Trade has actually become a good model of what record stores perhaps need to do to survive: to be as ruthless as possible. In 2014, the chain told Nottingham City Council it was considering opening a store in the city, but might open in Manchester instead. "It is clear that a rates incentive package is something that would make all the difference in bringing them to Nottingham," says a council email, seen by The Quietus. The council ended up giving Rough Trade a five-year exemption from business rates, worth over £28,000 a year. Efforts like that potentially give it an advantage over competitors. Rough Trade opened in Notts down the road from The Music Exchange, a non-profit record shop that closed 18 months later. Rough Trade's presence cannot have helped, although The Quietus understands The Music Exchange never broke even. At the end of 2017, Rough Trade received loans from XL Records and Les Nouvelles Editions Independantes, a French company that owns a majority stake in the music magazine Les Inrockuptibles, so it does have the finance to get exclusives. (It also received a loan from XL in 2015). When asked about all this, Stephen Godfroy, Rough Trade's co-owner, said in an email that working with labels on exclusives will "hopefully achieve greater success for that artists/release than would have otherwise occurred if we hadn't decided to collaborate." Competition is natural, he added. "Clearly, the more opportunities to purchase vinyl, the greater the competition amongst those retailers. However, those retailers that prosper will do so because they have something special, unique to offer, be that an enticing atmosphere, a strong local following, an excellent curation of stock, etc." On the specific point about The Music Exchange, he said that having several record shops in an area should actually increase interest and footfall. "If a shop finds that it has no choice but to call it a day, there will undoubtedly be a number of factors at play, but if all else is well with the business, customers having a choice between retailers shouldn't be one of them." Hickman, who used to work at Rough Trade, agrees with the thrust of Godfroy's points. "There's a bunch of record stores that hate Rough Trade and the fact it does limited editions," he says. "But Rough Trade have five shops and need to sell x amount of records to stay in business. They've been selling records for 40 years, why shouldn't they have a limited edition of Nils Frahm? "I sold 10 copies of that to regular customers and I'm happy with that. There's far too many people who worry about what other shops are doing and not their own." But what can shops do if they're already working flat out? That's a question no one seems able to answer, apart from to start selling booze (the margins are a lot better) and hope the vinyl boom keeps booming. If that happens, they'll put up with the workload and they'll put up with Record Store Day's litany of releases – even the Shaggy reissues. It is their biggest trading day of the year, after all, and the only reason some can keep going.